Central Motors Ltd of St. Andrews. Homepage. 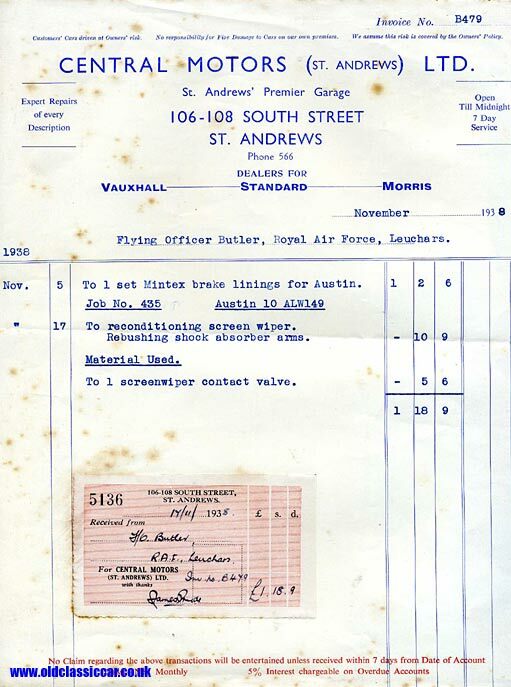 This page: Invoice for a small repair made to a 1933/1934 Austin 10 in St. Andrews. Several items of paperwork relating to the motoring activities of Flying Officer C.A. Butler already appear in this section of the site, this page for instance relates to his purchase of a new Austin 10 saloon in 1946. In 1938 though he was running an earlier - 1933 or 1934 - Austin 10, registration ALW 149, while serving with the Royal Air Force (RAF) at Leuchars in Fife, Scotland. This invoice relates to a some odd items of work undertaken on the Austin car by Central Motors (St. Andrews) Ltd, in November of 1938. The garage supplied a new set of Mintex brake linings for the Austin (£1 2s 6d), perhaps fitted by Mr Butler himself, and they also repaired his windscreen wiper motor and re-bushed the car's shock absorber arms. Invoices for work done to the same Austin 10/4 in 1941 and 1942, but by a garage in Dunfermline, can be found on the John Goodall & Co. page. Apparently the garage, in addition to offering vehicle repairs seven days per week, and being open until midnight, could also sell you a brand new Vauxhall, Standard or Morris motor-car from their premises at 106 - 108 South Street, St. Andrews. References online suggest that these premises are now in use by an estate agent or a solicitor, but no longer by a garage. Entries for Central Motors Ltd appear in the 1949 and 1959 copies of the RAC Handbook, so it seems that they were in business for quite some time. More old items of motoring paperwork can be found in the Motoring Collectables section.